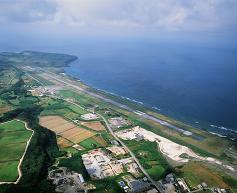 Yonaguni Airport was constructed by the Imperial Japanese Army in June 1943. In August 1957, private airlines began operating from the airport. The runway was extended in April 1958 and then paved with asphalt emulsion in September 1968. YS11 aircraft began operating from the airport in December of the same year. The airport’s approach direction was found to be against the Aviation Law, which became applicable along with Okinawa’s reversion to Japanese administration in 1972. It was therefore operated as if the runway were shorter than its actual size, and resumed service with an 800m-long runway in March 1975. The airport was then upgraded in accordance with passenger demand for larger aircraft and resumed service as a tentative jet airport with a 1,500m-long runway with strengthened paving structure in July 1999. A project to extend the runway from 1,500m to 2,000m was launched in 2001 and resumed service with an 2,000m-long runway in March 2007.